Post your How to Storys-Articles here and please only How To's related to Boatless Fishing. This rig I use a lot. Not sure if it makes any difference on the bead color but I use florecent green. When the Sp Macks are around, at least that's what i think are doing it, they hit the bead and cut my line instantly. I have gone to no bead, willing to take the risk of the swivel or lead banging against my knot. Not sure of the results yet as I have just switched. Not sure if this has been said but the best leader line or bead color to use so it is not seen is red. Red is the least refracted color. I've made all my rigs with red for a couple years now. Using a green bead. yes color makes a huge difference. Green is like putting a target on your rig. if links are frowned upon forgive me. This also explains why different color lures work in different depth of water (opposite red as you want the lure to be seen). Great explanation guys, thanks! I realize the last post was 10 months ago, but I am trying to pretie some rigs before I head down to your florida paradise. The question I have is, on the 3 way swivel rig do you have problems with the sinker and it's 6 inches of line wrapping around the leader? I usually use a rig similar to the fishfinder, excpet with a sinker that is tied in palce instead of letting line slide through it. When I fish current, I do get line twist and wrapping around. I hope the 3 way rig prevents this. Thanks!! doclorenzo wrote: Great explanation guys, thanks! I realize the last post was 10 months ago, but I am trying to pretie some rigs before I head down to your florida paradise. The question I have is, on the 3 way swivel rig do you have problems with the sinker and it's 6 inches of line wrapping around the leader? I usually use a rig similar to the fishfinder, excpet with a sinker that is tied in palce instead of letting line slide through it. When I fish current, I do get line twist and wrapping around. I hope the 3 way rig prevents this. Thanks!! I would use the fish finder rig. Use a barrel swivel between main line and leader. The barrel swivel will prevent the leader from twisting. The 3 way swivel work well with long long leader for line shy fish. The Judge asked the prostitute, "At what point did you realize you were raped?" The prostitute replied (wiping away tears), "When the check bounced." theprofessor2009 wrote: For the fish finder rig is there any way to stop the egg sinker from moving up and down the line? Thanks. I know this is an old question, but for anyone just reading this I have a tip we use when carolina rigging for bass back in the day. When we wanted to fix the weight at a specific spot we would jam a toothpick into the hole of the weight then break if off flush with the weight. This should hold the weight in place and if you want you can still move it up and down but it should stay in place. Haven't tried it with heavier weights and the hole would need to be no bigger than the toothpick, but it's a cheap and really great way to do this. Nice man thats interesting! Good stuff never thought of that. I use the sliding sinker rig alot. 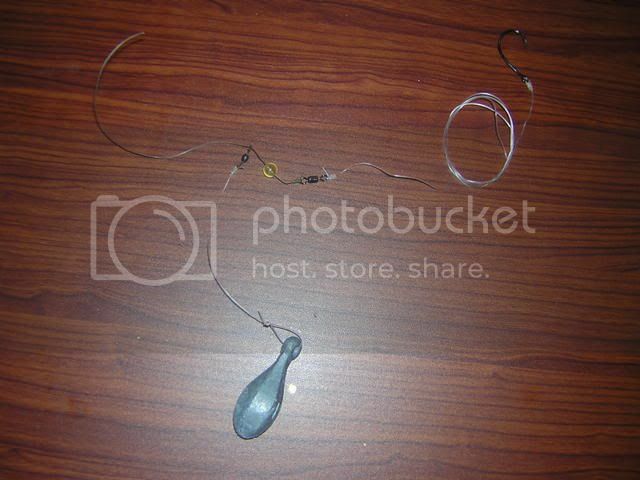 A sliding sinker rig puts the bait on the bottom and then allows a fish to pick it up without feeling the weight or drag of a sinker. The line is slipped through the sinker or through a sliding sinker device (sinker slide) where there is a swivel attached to a tube where the line goes trough it, and then tied to a swivel with a bead that acts as a sinker stop. Surf fishermen such as myself use a pyramid sinker attached to a sinker slide because it has less chance of damaging or fraying the line. The pyramid tends to anchor the rig in the surf/sand. If you don't have a sinker slide, a swivel will do the same thing. 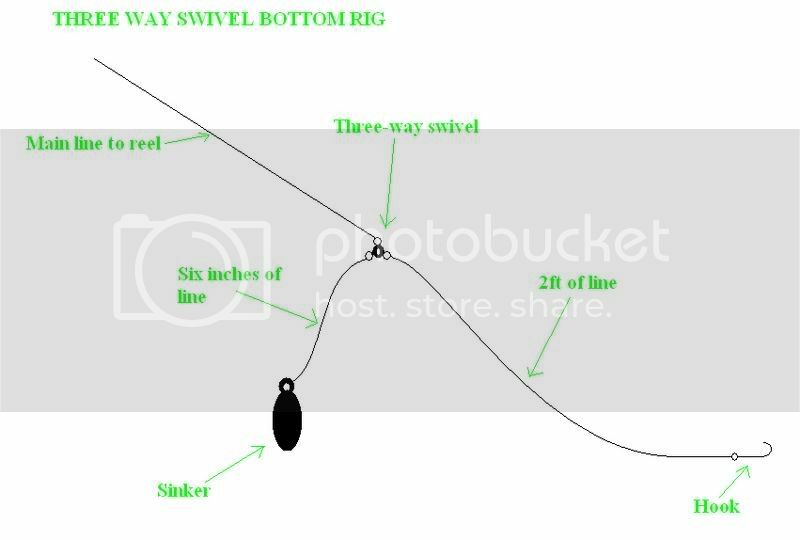 Some anglers tie a short length of light line to the swivel or slide and then attach it to the sinker. 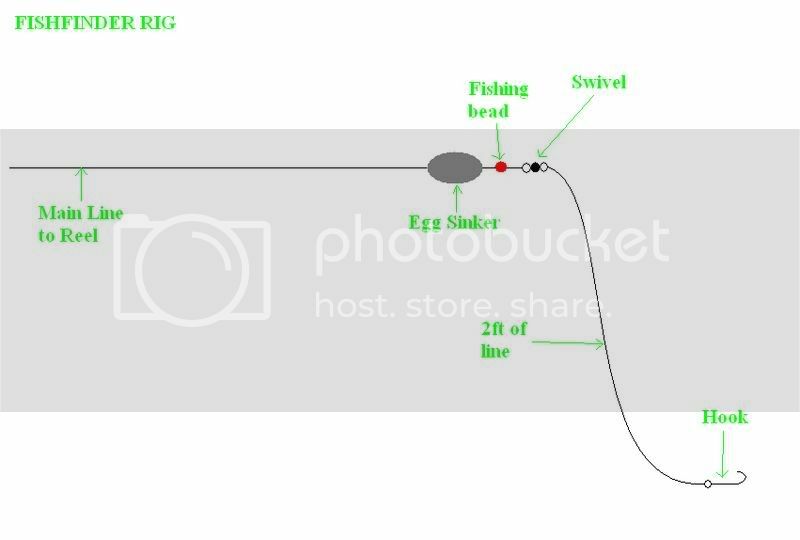 If the sinker hangs in the bottom, the light line breaks easily and the rest of the rig is saved. Below is the one's I use. Something I learned is that the leader shoulder be longer if there's little or no current and short if there's a lot of current. The shortest that I use as a leader would be 1.5' and the longest is around 4'. Try this out if it works for you guys or not. This is used for the sliding setup more. i.e. FishFinder and the sliding swivel rig. My experience with saltwater fishing is watching others. Threads like this are especially helpful as I have no previous experience and hope to get out and try some fishing within a couple weeks. Thanks again for all the great information. or you could use hollow core pencil lead and crimp it off to keep it in place. thatjohnkid wrote: When I was at the pier yesterday a older feller told me that I'd probably do better if I was using a pyramid weight instead of the egg sinkers I have been using. He said my bait wouldn't drift as much. Any one have a diagram for that setup for that I could just modify to use. I'm not sure how I would got about using a pyramid weight, never used one and the ones I've seen people using have these plastic pieces on them. What are those? 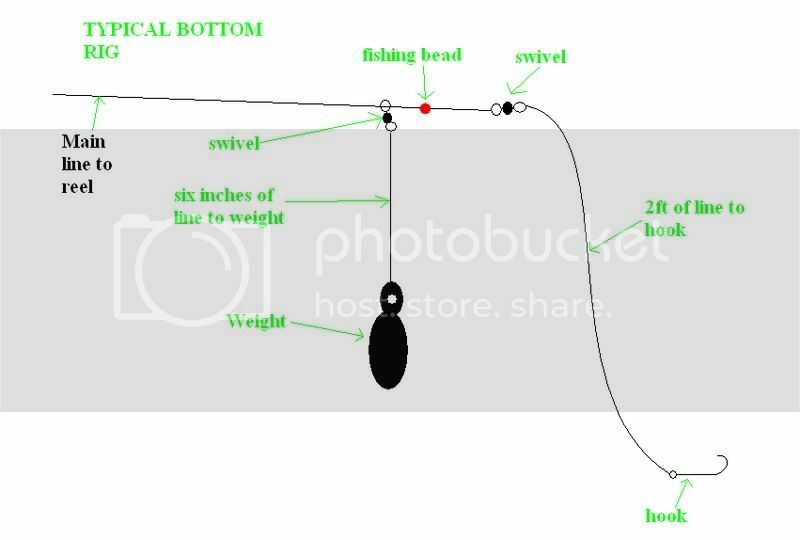 those diagrams are just guidelines.you can slightly modify them to your preference(make the leader slightly longer or shorter,change the type of weight, hook) and it will still work.i recommend you use the "typical bottom rig" and just replace the bank sinker with the pyramid sinker if ur having problems with drifting and crossing peoples lines. 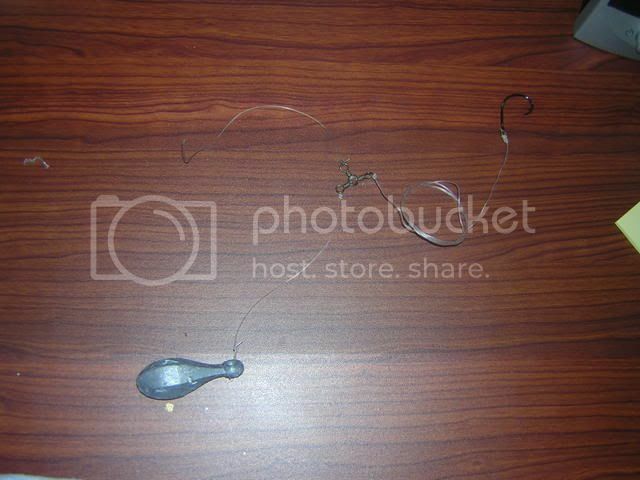 Many like to use bank sinkers cause they hold pretty good and they dont snag as much in rocky places. those plastic things are called sinker slides and they dont come with the weight.It comes with a snap to attach your sinker and you feed the line through the little hole and tie on a swivel.you attach your leader to the other side of the swivel.It basically takes the place of the egg sinker in the "fishfinder rig", and the sliding weight assembly in the "typical bottom rig". you can buy them at any tackle shop. ive seen them in walmart and kmart too. you can use any of those rigs and they all work cause they all follow the same basic principle. Those slider rigs offer litte resistance to a cautious fish taking bait. They're used to fish small sand crabs for big sturgion in the Columbia River. A little history; s'il vou splait. What you're calling a 'fishfinder' rig started life being called a 'slider' rig. The reason being that you would cast it out and retrieve slowly, dragging the weight across the bottom, looking for fish; thus fishfinder. This thread has provided more information than the first three Google results when searching "saltwater fishing rigs". When tying on the hook does anyone use a snell knot? I am a loop knot and improved clinch knot guy, but think a snell would work good also, to keep it inline. I know snelling works great if the hook eye is down turned or up turned. With the straight hook eye i usually use a grinner or a San Diego jam knot. I know you can snell a regular hook, but i wonder if it puts too much strain on the line as it passes through. Stormsbear wrote: I know snelling works great if the hook eye is down turned or up turned. With the straight hook eye i usually use a grinner or a San Diego jam knot. I know you can snell a regular hook, but i wonder if it puts too much strain on the line as it passes through. You are spot on. I snell with the gamakatsu j hooks that have a down/up turned eye. With inline circle/j hooks the line coming off the snell can cause friction against the hook eye and make it a weak spot in the line. Thanks a lot guys. Just what I needed to know. 1-2 oz Disc sinker. Followed by a small green bead, then large luminous bead Green or Yellow). and then another small green bead. This sits against the swivel and I am using the new clear plastic ones, Then your fluoro leader and hook. This has been working on Snook. Just caught a 37 incher on 6/15/12. As for bottom fishing, does anyone got tips on which rig will not get snagged on rocks as much? Seems like a lot of the places I've fished around Pasco/Hernando/Citrus counties have some hazardous beds. Which as I understand should be good for fish, but I loose a lot of rigs. This rig can easily knock out 10~20 LB grouper... Detail info can be found somewhere in this forum. A deadly Pampano rig was observed by KOTS being so constantly pissed off by looking at an Asian Pampano killer at Dania, and we cracked the secret and developed our owns with some improvise. And worked very well... unfortunately, most credit goes to KOTS... Detail info can be found somewhere in this forum. Someone above asked what the purpose of beads was in rigs. It is mostly its to stop damage to a knot from a moving sinker or similar. KeiranHn wrote: Someone above asked what the purpose of beads was in rigs. .perhaps true bout beads preventing line & knot damage with a sliding weight, in either case with/out beads the strength of the line needs to be checked every 5 -10 cast or so; especially with MONO over BRAID. it will fail at this point... also, bottom rigs of this kind lay on the bottom and does cause the line to weaken from sand, rocks, shells etc. gotta check the line..
sinker/swivel stuck and line tangle are something that never happened to the experienced fishermen. Also, bead is made to attract fish and it could be the cause of line cut by toothy fish...(you need to see where the line cut) And king (or cuda) likes sinker (and big knot)...carolina rig (or what you call it, the rig using sliding egg sinker) is not recommended when there are lots of king or cuda. You need to use most appropriate rig to adapt the fishing circumstance... Sometimes, hook and line is best rig.